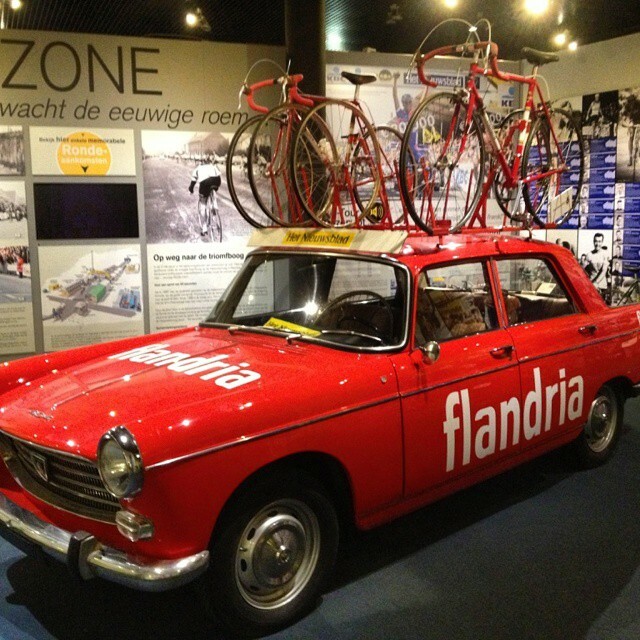 A photo gallery tour of the Tour of Flanders Museum in Oudennarde, Belgium. 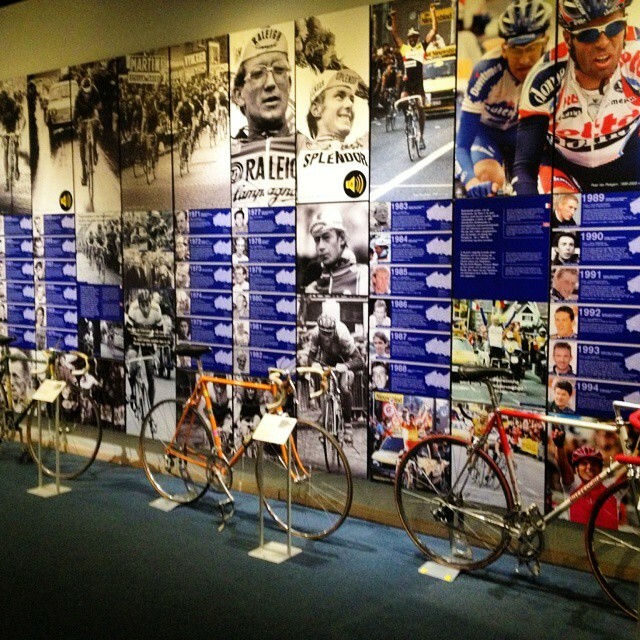 The Tour of Flanders museum in Oudenaarde, Belgium, pays homage to the great race and the riders who have played a part in it. 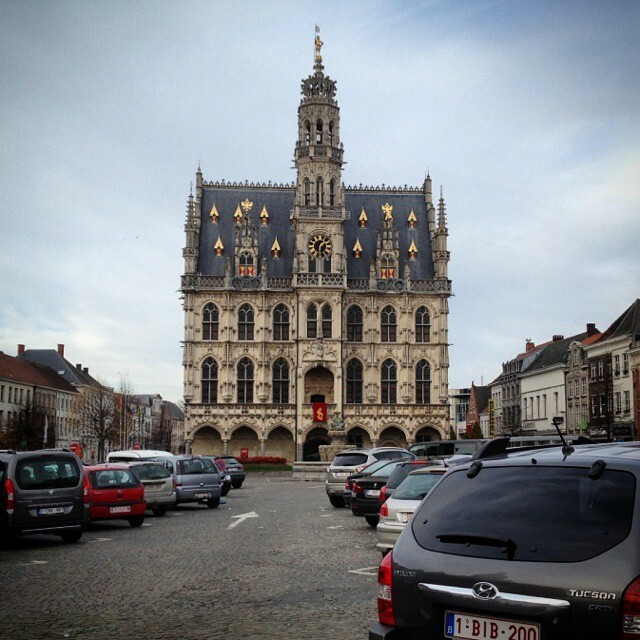 The Tour of Flanders is one of The Five Monuments in cycling (the oldest and biggest one day races on the calendar including Milan – San Remo, Paris – Roubaix, Liege-Bastogne-Liege, and the Tour of Lombardy) and the biggest bike race in Belgium. To the locals though, it is not just a bike race but an institution even for no cycling fans. In such a cycling obsessed country the Ronde is revered with the race and riders discussed in bars like football in the UK and on race day the country grinds to a halt to watch it. 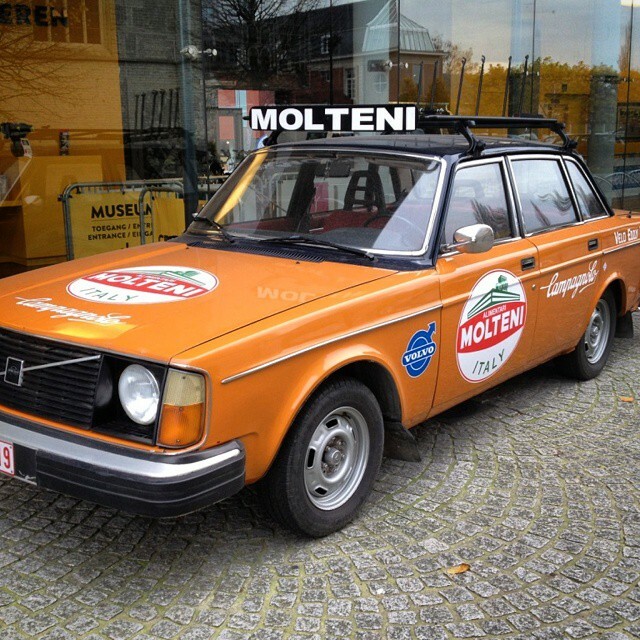 There’s no mistaking which building is the museum with the iconic Molteni team car parked outside. 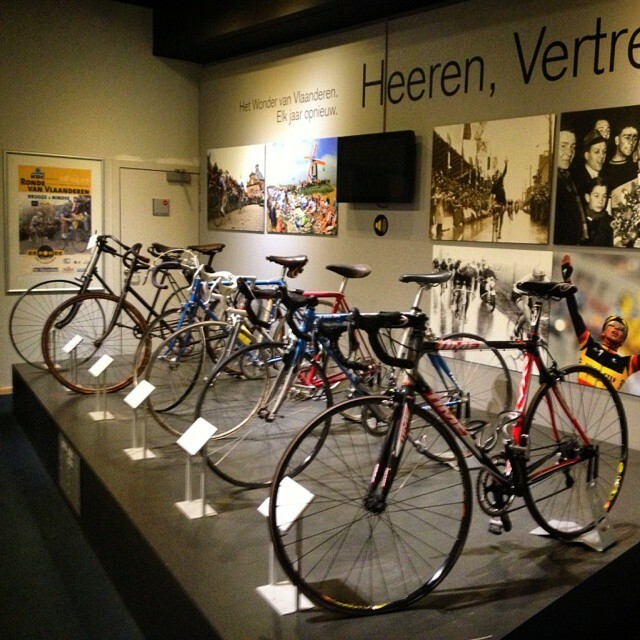 The museum is situated in the heart of Flanders cycling territory in the picturesque town of Oudenaarde where the race has started in recent years. 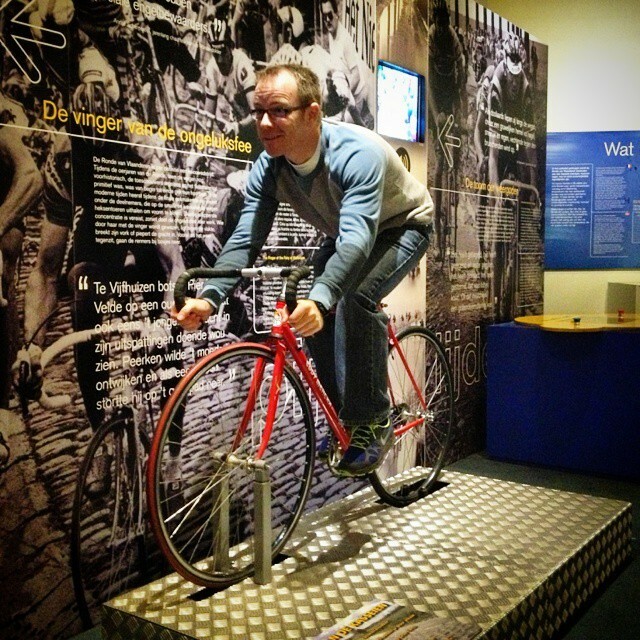 The good thing for UK fans is that it is only 20 minutes drive from Ghent so if you are over visiting the Ghent Six Day track meeting then a trip to the museum is worth the short excursion the following day before returning home. There are many artefacts from the race and riders who have taken part throughout its existence along with maps and interactive displays. They have a range of bikes from the late 19th Century up to the present day and also trace the development of clothing and accessories used. We particularly liked the fixed in place rollers which simulate what it’s like to ride on the cobbles and the fact they have a small race bike for kids to also experience it. You can’t help but get absorbed into the atmosphere of the race and just how much it means to the Belgian population. 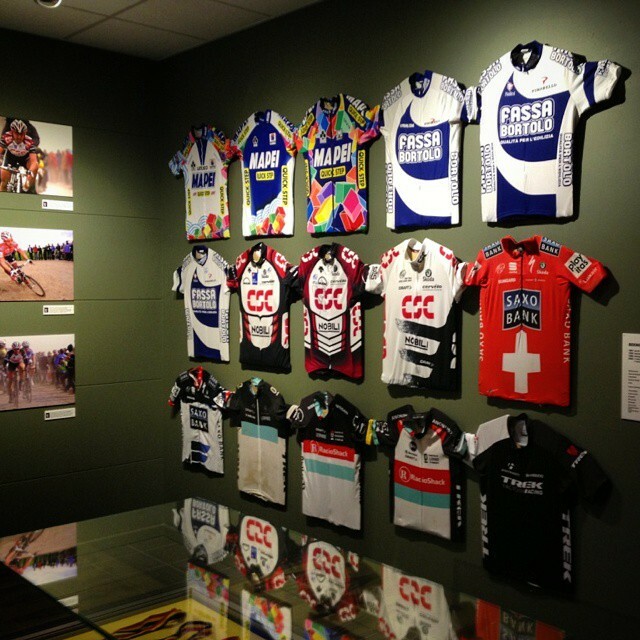 The Swiss star and Flanders hero has his own temporary section in the museum including his 2013 winning bike and jerseys from every team and national squad race he’s ridden! This is a great section on the Swiss rider Fabian Cancellara who is a three time winner of the event and a darling of the Belgian fans, despite not being a home rider, for his sheer dominance and love of the race. They have all his trade team and national jerseys and several bikes from different periods in his career including his 2013 race winning machine. This may seem an odd place for a Swiss rider to have his collection but the way he prepares and attacks the race shows how much he respects and loves the race which is in turn loved by the fans. This is a temporary section though and is due to finish t the end of 2014. There’s also a cafe on site with more Belgian beers than you can imagine as well as good coffee. If you fancy going for a ride then the museum also has showers which can be used for a small fee which made us all wish we had brought our bikes to sample some the iconic route nearby. The gift shop has some interesting clothing and race related items at reasonable prices so worth a look round. 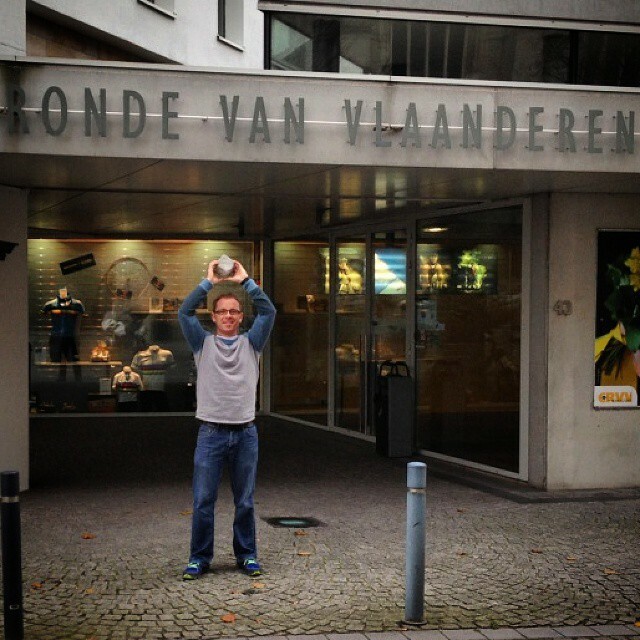 The museum is open all year round except Monday’s, Christmas Day, Boxing Day, New Year’s Day and ironically on Tour of Flanders race day; we did say the country grinds to a halt to watch the race! Several bikes are on display from a late 1890’s model right the way up to a mid 2000’s. It’s incredible to think that riders used such basic machines on such brutal roads over huge distances in awful weather making you appreciate their exploits even more. Every winner of the Ronde is listed here. This was our favourite interactive piece. The roller is elliptical to simulate riding on the cobbles and is odd at first until you get the gear turning, just like the real thing. We also liked the mini version beside this for kids and glad they were both well secured to keep them upright. There’s even a car inside. 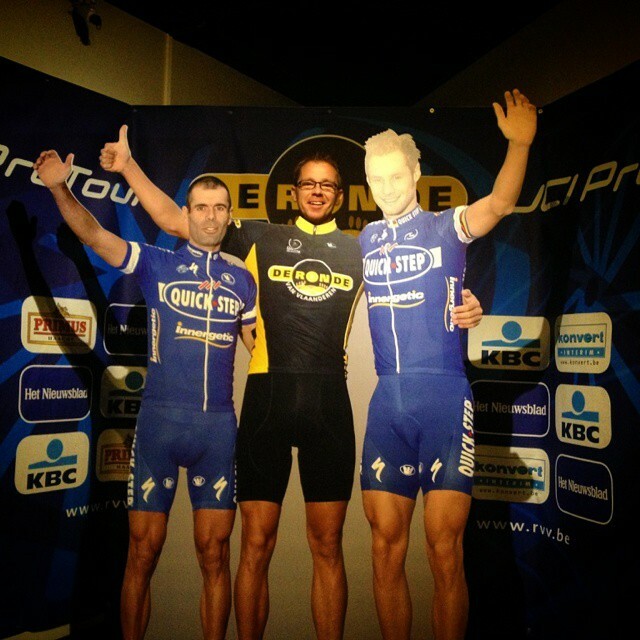 No one can resist a photo opportunity with Peter Van Petegem and Tom Boonen even if the lighting for the official museum cameras makes ours look odd. 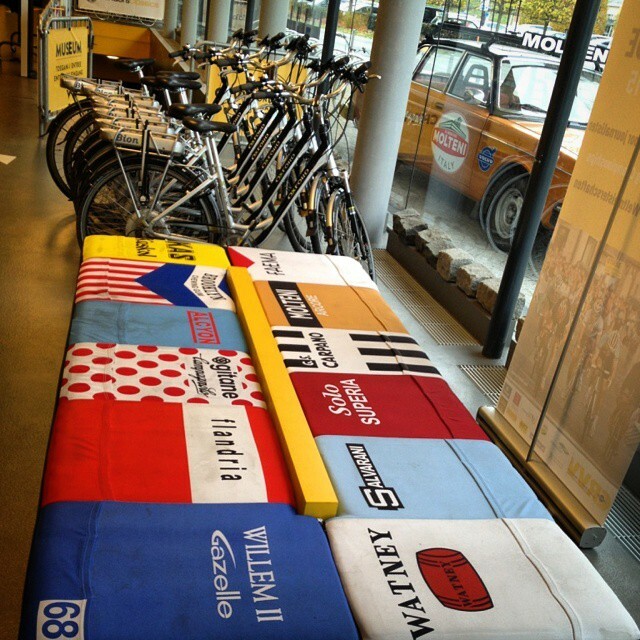 We liked the seats with their covers done as iconic jerseys. The race starts in the town centre and on race day this area is home to the team buses and sign on. We know the winner doesn’t get a cobbled trophy like Paris-Roubaix but with the council carrying out pavement works beside the museum and a huge pile just sitting there we couldn’t resist holding one aloft to the wonderment of passing locals. Tagged belgium, cobbles, cross, cx, cyclocross, fabian cancellara, flanders, flandria, heritage, history, molteni, racing, vintage, volvo. Bookmark the permalink.